I am pretty sure most would think I decorate like crazy for the holidays because I am the creative type. Well truth be known, I have a most difficult time going all out at Christmas since becoming an empty nester. I'm in that difficult period between kids and grandkids. Honestly it's just not that fun right now. So for the last few years I grumbally, no I don't think that's a real word since a red line just appeared, pull out just 2 out of 7 boxes of the sparkly stuff and put it out. Don't get me wrong now, I love Christmas. I love the season and the reason. I love the lights, the music, the scents and sometimes even the hustle and bustle. This year we pulled everything out and I went through it all and tossed much of it. You know the stuff I'm talking about; the plastic picks that are chipped, the many, many garlands that are never used, that thing I just had to have at Target but never really used. Yep, it got trashed or donated. Someone will love that thing from Target, I'm sure. And they will no doubt pay next to nothing for it. You know exactly what to keep when going through years of collecting holiday decorations. You keep the things that make your heart swell with mushy feelings. The vintage ornaments from your childhood, the beautiful handmade gifts from crafty friends, the first Christmas gifts as a newly wed couple that just make you smile. And of course the things that made your child's eyes light up every time they looked at it. I have always had a difficult time decorating because I love all styles, I love sparkly as much as I love rustic. I've never understood how someone could only like one style. My home is a haphazard mix up in many styles that just seems to work. I am not vintage, industrial or modern. I am everything mentioned and then some. 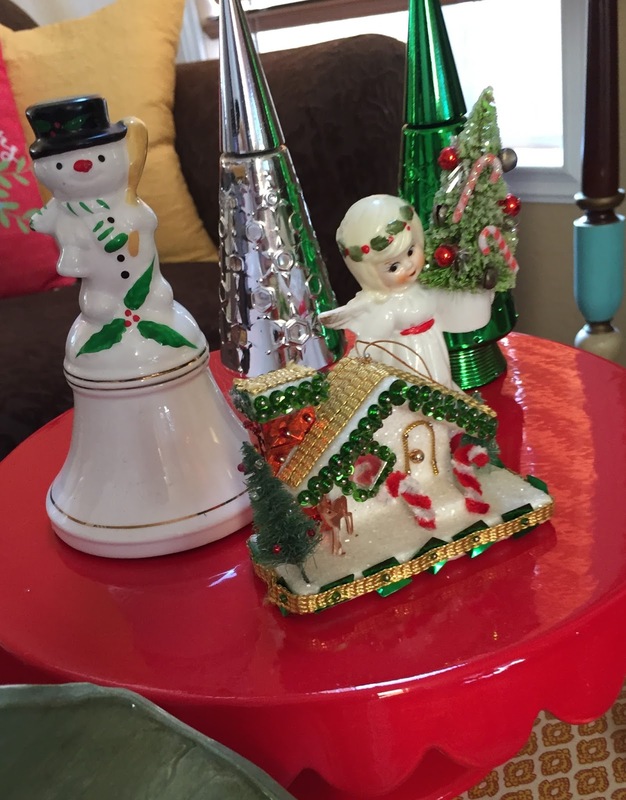 I decorate with what I love and that goes the same with Christmas. I think that's the only way to make a home yours. Come let me show you some of my favorite Christmas things old and new. A favorite spot to decorate...a crystal bowl filled with childhood ornaments from the 60's, bottle brush trees from my childhood that have seen better days but make me smile just the same. The felted snow girl is a little something I whipped up. The milk glass vases were my mothers and the white opalescence plate and creamer are depression glass from asset that was my grandmothers. Love this Hallmark book from 1971. My mother gave these to us often and I am so glad I saved them! A handful pf more Vintage...Avon Christmas trees that were long ago filled with bubble bath. I made ornaments like crazy as a young teen. We bought kits that were styrofoam, sequins and beads. She's new, a collection from Target about 10 years ago. I bought a slew of these because they are adorable! My sister gave me this years ago, back when these whirlybirds were actually from Germany and not China. My son has always loved this and still does! Thanks for sharing. I am like you, I don't have a particular style. I love all the holiday decor. I love your collection! I have a few depression plates just like that, it's so delicate. I need to do what you've done, go through all of our tubs and just keep what's important and brings my family joy. What a treat! Thanks for sharing.